Our little chis are honestly one of the cutest dog breeds that melt your heart. 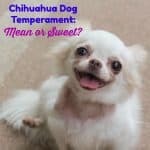 Not that other breeds are any lesser, but Chihuahuas are an entirely different game. Despite their tiny stature, they have large personalities. They are bold and stubborn and don’t consider themselves any less strong than large breed dogs. 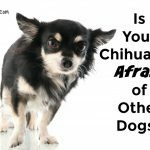 But it doesn’t mean that Chihuahuas are inherently aggressive; how they respond to situations and the habits they develop largely depends on how you train them. 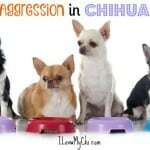 So usually I begin with offering suggestions but with problems such as aggression, the mistakes you may make while acting out in frustration can worsen your chi’s behavior. Of course, the responsibility of a new canine member in the house can be overwhelming and that coupled with a snapping and growling dog can be quite challenging since you weren’t expecting it- but remember that it is essential to keep your calm at this time. 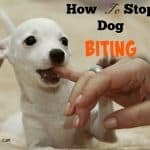 Don’t make the mistake of lashing out or yelling on your pup or physically threatening the dog as that may lead the Chihuahua to think that you are fighting for the alpha position. Don’t lock your dog in a room as a punishment; instead use it as an opportunity to correct help him understand the right behaviors. Many dog-parents may not be aware of the fact that fear is a primary cause of aggression in dogs. They act out when they meet new people or encounter new experiences that they aren’t accustomed to. Therefore it is crucial to socialize your pup from a young age to help him get over the fear of the unknown. Make sure you take him out and walk him around the block, don’t just carry him yourself. Instead let your little monster explore the world. Let your Chihuahua meet other dogs, people and ensure that all experiences are positive, so your pup becomes aware of the fact that new sounds and sights are meant to be fun. 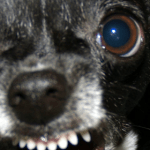 A common reason behind canine aggression is that Chihuahuas consider themselves the pack leaders and therefore don’t respect and obey your commands. You might have seen your pup growling when you try to take away a toy or touch his food bowls. This is because they consider it upon themselves as the leader to guard and protect their belongings and gradually the habit may lead to the onset of other aggressive behaviors. As soon as your chi realizes that you are the one who makes the decision of giving out food, he will know who the leader is and will begin respecting your position. To train your dog, make it a habit only of giving out the delicious dog food after you chi obeys the sit command and waits for his meal. Dogs need structure in their lives, and for that, you need to set house rules. 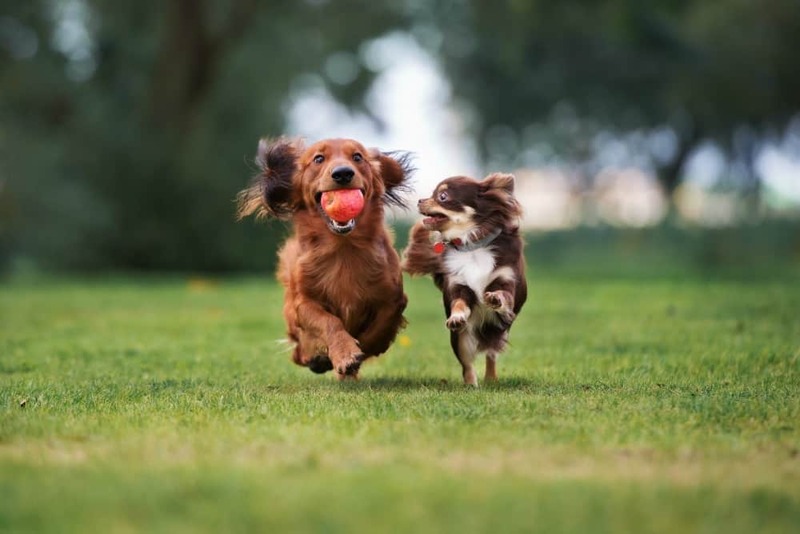 Don’t let your dog dominate as the habit may gradually turn into aggression. The key is to make a firm decision and stick to it. You can decide these rules according to your preferences, when the food should be given, what furniture your chi is allowed on, what possessions belong to them, and when is playtime. Be firm and consistent with these rules without being harsh on your dog. Use positive reinforcement techniques to make your dog understand and respect the boundaries. Teaching your dog basic commands and cues is necessary. Although this may be difficult with aggressive dogs, which see themselves as the alpha, with consistent effort you will be able to succeed. Even if your chihuahua has already been through obedience training, a recall session each day will still be useful. Commands such as sit, stay and come are beneficial as these will aid in stopping him from attacking or threatening any stranger. 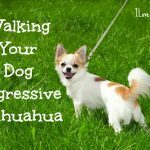 Training your canine to walk on a leash is also crucial as it will help establish you as the alpha and enable your chi to understand how to respond in acceptable ways. 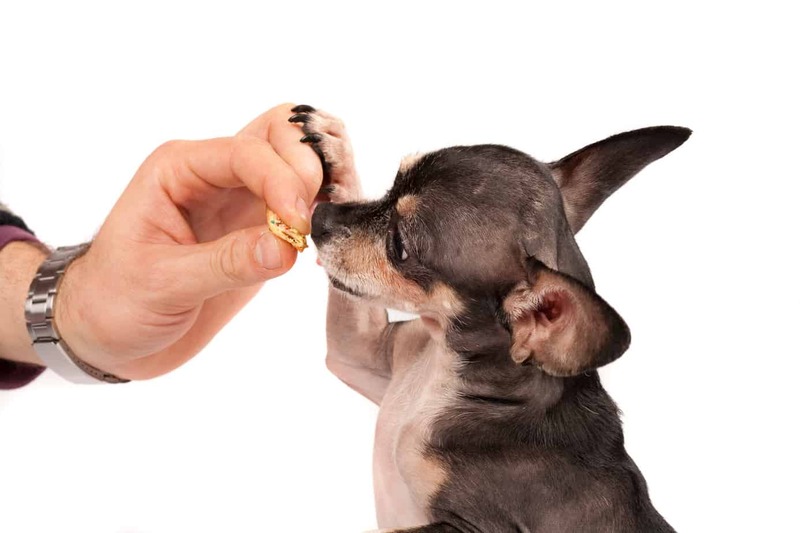 Whenever your chi obeys a command or stops growling and snapping over something that he previously used to, praise and reward him with treats. 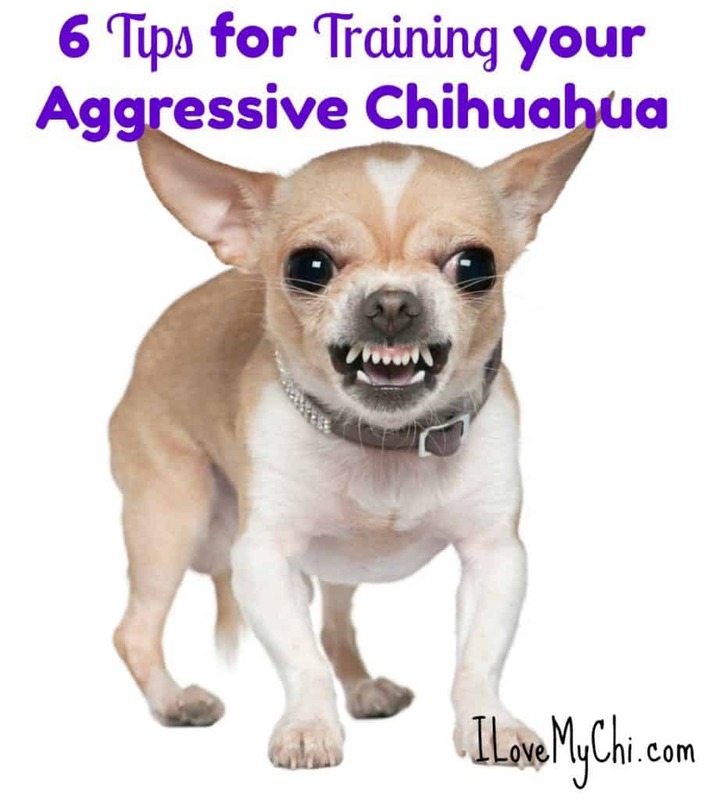 Whenever your dog begins to display aggression, you must command him to stop and when he obeys make it a point to reward your chihuahua with treats. You may have to act firm when your Chihuahua doesn’t comply to the commands, you don’t have to be too hard on him but be sure to get the message through. Using food as a reward and treat to encourage your chi to look at you as a leader is a good idea, but it can become a GREAT IDEA AND TEACHING TOOL if you take the time to understand how dogs know their place in the pack. When a pack is eating, say at a kill, (yes, you chi isn’t out killing deer, but their instinctive enforcing of the pack hierarchy is the same) every single member of the pack knows whether they can join in the feeding by the smell of saliva on the meat. As long as a superior member has taken some of the kill and has left his saliva on the meat, the next member down the line knows that he can join in the kill. Watch videos, a pack member who is lower tries to horn in and eat, and raise his status in the pack…the animals higher in the pack will quickly and viciously correct him, letting him know to wait his turn. In order to enforce who is the leader of the pack, there are 2 things you must ALWAYS DO RELIGIOUSLY. #1 establish yourself as the Alpha, no nonsense leader. and #2 As leader you must NEVER, no matter how intentionally, change the order of the pack hierarchy. How do I know what I’m talking about? I currently have 15 rescue dogs of various sizes and breeds, most who were so broken and abused, that getting them adopted safely was out of the question. There are no fights, they eat with no attempting to guard food, they have the choice of sleeping together or going to beds placed in out of the way, quiet places…each has their own spot. When handing out treats, I NEVER CHANGE THE ORDER THAT I HAND OUT TREATS IN. To do so would encourage a fight for different placement in the pack. By greeting them in order, giving them treats in order, I, as alpha, am reinforcing their place in the pack and my place as leader. When I give them a treat, or feed them, I ALWAYS, ALWAYS, SPIT ON THE FOOD OR TREAT. Now I don’t mean hock a lugey…I mean a simple spit…why? I as leader had MY SHARE FIRST and am now giving them their treat. Same with the food, I as the Alpha have “hunted” and provided food for my pack. Since I am secure in my role, they are more than happy to be Omega dogs. The only time a dog will challenge you is if they are not secure in your roll as Alpha…an Alpha is secure, calm, fair, and makes his pack feel safe. He is CONSISTENT in his actions…they are allowed on the couch or not, but make up your mind and stick to it. Get your dogs SPAYED OR NEUTERED, as Omegas, breeding should not be part of their makeup…that is reserved for the Alpha and Beta. If you have a family situation, whoever spends the most time with the dogs should be the Alpha, the spouse, the Beta and every single child, IN ORDER, ahead of the dogs. A friend had a problem with her dogs respecting her and her husband, but not her two children. I began by having her and her hubby spit on the food, then the two children were given the dog bowl, the dogs had to sit and the children spat into the bowl..then the bowl was put on the floor and the whole family said OK. Within 2 weeks, the dogs were no longer crowding the children or attempting to take food from them forcefully. They didn’t jump on them and began to listen to commands from the children, such as sit. Dogs are wonderful, loving creatures that are eager to please, that is in their genetic makeup. But you must learn to SPEAK THEIR LANGUAGE! If I met you on the street and was able to say your name, but the rest of my encounter with you was in gibberish, or Chinese or any other language, would you know what I was telling you to do? No? You would be confused, with no clue as what I was asking of you. Well, that’s how your dog feels. Yes, repetitive commands, with reinforcement are learned, but as you know, it takes time and patience. Once your pack looks to you as the leader, they can relax, secure in the knowledge that as a strong Alpha, you will defend their territory, keep away intruders and provide food and a secure den. Thanks for your insight Nina. Great points. Thanks for your advice, I just hope it works for me. I have two half breed chihuahuas and one of them is 13 plus. He can be quite aggressive when I go to touch him. He used to be the best dog ever for being able to touch him anywhere, even the vet was extremely impressed with him but within the last 3 ir 4 years my dog has become aggressive and I haven’t been able to make him stop biting me when I have to work on him. I am going to take your advice to heart and see what happens. If he has become aggressive as he has gotten older, he might be helped by daily doses of CBD oil. I have been giving it to my elderly border collie since she has gotten very nervous and anxious as she has aged and it has helped her get back to her old sweet self. The stuff isn’t cheap but you don’t need to use much and it’s worked better than anything else I have tried.